Research has shown that LinkedIn members are more than twice as likely to be in the market for a vehicle than the general U.S. population, and with buying power to convert, this influential audience has become increasingly attractive to the auto brands LinkedIn works with. Furthermore, over 1/3 of in-market LinkedIn members say auto brands have an opportunity to improve brand perception by sharing relevant content. But how do auto brands determine what type of content is right to publish on LinkedIn and how can brands make sure to get this content in front of exactly the right audience? 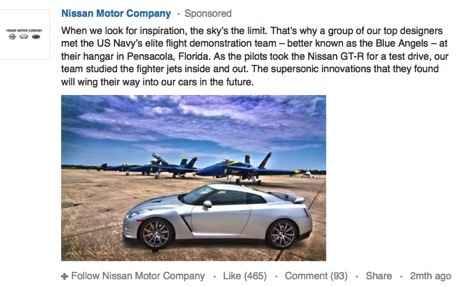 Mercedes-Benz USA and Nissan were the first auto brands to participate in the LinkedIn Sponsored Updates pilot prior to launch, producing content marketing success on LinkedIn. In recent campaigns, both brands created engaging content about new vehicles and technology that members say they want to see from auto brands on LinkedIn. They then extended the reach of this content by utilizing Sponsored Updates to get it in the feeds of influential professionals in their target market. Leveraging two distinct approaches, they drove engagement rates as high as 1% with this high-quality audience, many of whom were VP-level and above. Read more about how Mercedes-Benz USA and Nissan built awareness and influence amongst the high-quality professional audience on LinkedIn in the case studies below. 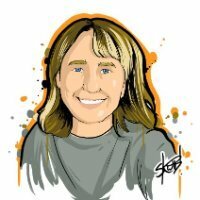 Interested in reaching this influential audience with your Company Page updates? Find out how to get started with Sponsored Updates here.